If you're someone who enjoys participating in the Valentine's Day tradition of getting your loved ones a gift, you may already be coming up with ideas on what to give them this year. Before you stress out about it, however, you should read this post and consider presenting them with delicious treats! Sweets are always a good Valentine's Day present. If you don't want to just give out candy like it's Halloween, however, you should drop by Great Harvest in Austin. 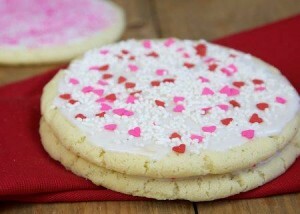 They have all kinds of flavorful treats (like the sugar cookies pictured above), that are sure to show those people in your life that you care about them. A personalized bread gift basket filled with the recipient's favorite wine, movie, and treats, will let them know how special they are to you, and that you know them well. Plus, you can then spend some time together as you share the items in the basket (e.g., you can eat the treats while you watch the movie and drink the wine). This Valentine's Day gift can be for your significant other, or you can enjoy it with a group of friends. To go through with it, you need to create a menu, get the best ingredients for it, cook the dinner, and put together the right ambiance. To make your lovely evening even better, remember to opt for fresh and tasty bread from Great Harvest. If you want your Valentine's Day celebrations to be extra special this year, be sure to give your loved ones delicious gifts from Great Harvest in Austin. They have a wide menu of breads and sweets filled with fresh options to delight anyone who tastes them. Call (512) 329-9216 to learn more about the flavorful menu from the best bakery in Austin.